These are by far the best, yummiest, healthiest, easiest dessert/snack I have ever had! I always keep these in my freezer for a quick bite or for a guilt-free dessert. I am also a self-proclaimed chocoholic (my poison: dark chocolate). I usually don’t buy bananas because we don’t eat them often. But when we do I always end up using them in dessert! Line a cookie sheet with waxed paper or parchment. Slice bananas into coins about 1/2 inch thick. Spread a tiny dollop of peanut butter on top of each one. In a small bowl, combine the chocolate chips and milk (­remember, less is more). Microwave in 15 second increments until you can whisk them together. You want it to be a dip-able consistency, not spreadable. Add a splash more milk if necessary. Dip the banana chunks using a fork as a little chocolate-coating forklift, dipping them into the melted chocolate. 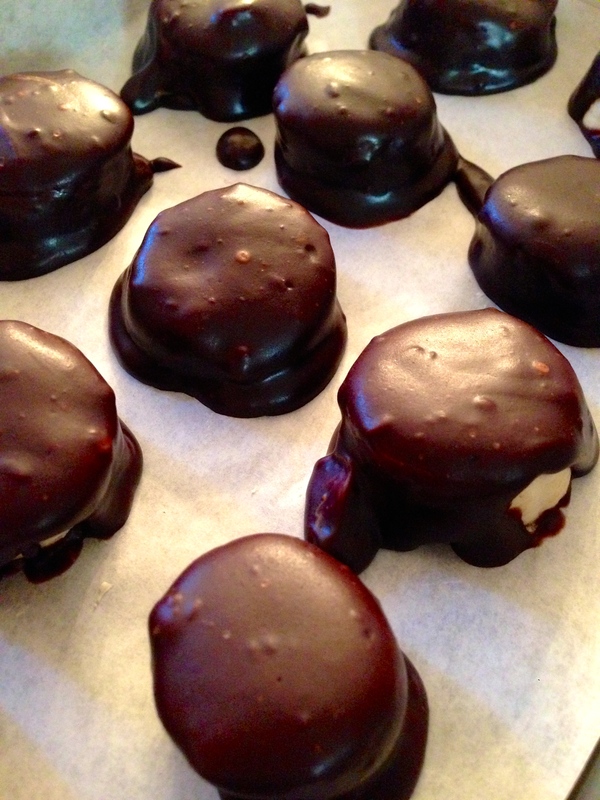 Place chocolate coated bananas on the prepared sheet and place in freezer until completely frozen (30 mins–1 hour). Remove frozen banana chunks from the sheet and store in a freezer container. By far the BEST girl’s night snack! Healthy finger food to curb any dessert craving! And just as easy as normal nachos! The great thing about this recipe is that you can really make it your own. If you are allergic to nuts (like my sister) you can omit the almonds, pecans, and peanut butter, and drizzle carmel on top instead. Or if you don’t like coconut (like my husband) you can simply omit the coconut flakes all together! This really isn’t a recipe that needs to be followed precisely. The lemon juice is simply so the apples won’t brown, and if you don’t like a lot of nuts, you can put as many or as little as you’d prefer. I am leaving all the optional “toppings” in the list below so you can pick and choose which strike your sweet tooth! Slice up some apples into wedges. Squeeze a little lemon juice over the apples to keep them from browning too fast. Melt some peanut butter (in the microwave, or in a pan over the stove works just fine)–until it’s super runny–and drizzle it all over the apples. 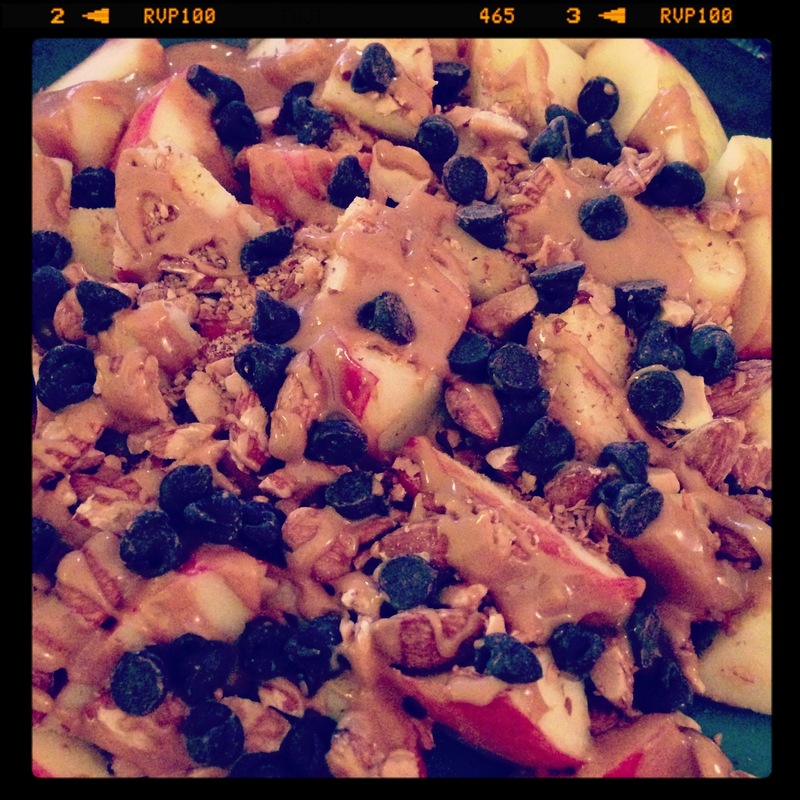 Next, top the apples and peanut butter with any of the toppings of your choosing (I like chopped almonds and chocolate chips).